Did you know that cotton is one of the most intensely sprayed crops in the world. Organic cotton doesn’t use the harmful pesticides that regular crops do, but that makes up only a very small fraction of the total cotton produced. After a bit of research, I came discovered that an excellent substitution; Bamboo. It is sustainable, practical, and has many health benefits that naturally develop in its growth. There is a property in bamboo called “Bamboo Kun.” This makes the fabrics that results from the productions of bamboo naturally anti-microbial. It lasts through dying and washing the fabrics, and help prevent any bacteria or fungus from growing on the fabric. Its a perfect option for those who have sensitive skin, and also helps to reduce body odor. Bamboo fabric even has an inherant UV protection factor that will help to keep your skin safe from the harmful ultra violet light emitted from the sun. Bamboo, as opposed to cotton, requires no pesticides or fertilizer to grow, and takes in five times the amount of greenhouse gasses. It can be densely grown and its roots retain water in the watershed, sustaining riverbanks and reducing water pollution. Bamboo also grows at an incredibly quick pace, so it can be harvested many more times than other plants. Bamboo fabrics can look and drape like silk, but are more practical because you can machine wash them on the gentle cycle and dry them in the drier or on the clothesline. It has many of the qualities sought in “performance” and “easy care” fabrics without the drawbacks of synthetic material and it has many of the fashionable qualities of silk, while being sturdy and vegan. As Diane von Furstenberg and Oscar de la Renta will attest, Bamboo can translate into high end designs as well. 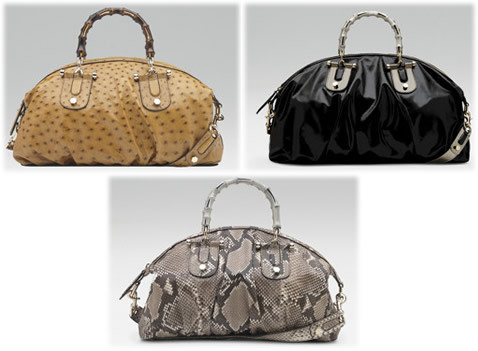 Gucci has also been using bamboo in its natural state in accessorizing its shoes and handbags. Bamboo is a great natural alternative to cotton. Its sustainable nature is perfect for the socially-conscious consumer, and it provides many benefits for the buyer. It is known as the plant with 1000 uses, and it is true. Besides being used as a fabric, bamboo can be used for landscaping and construction, turned into paper, used for drawing and illustrating, in medicine, as musical instruments, and yes, is even edible. One must question why such a versatile plant is used as infrequently as it is. Its elegance and natural beauty can add to any surrounding, and you can feel good in the fact that you are doing something good for the earth by working with it. Submitted by Christine Vandover on Sat, 06/07/2008 – 8:00pm. This unique flooring made from discarded belts is simply beautiful. It was a find at the ICFF show, from a co-worker of mine. The luxury leather flooring, is a new re-working of vintage leather belts and no two tiles are alike. It’s a glossy and hardwearing surface available by the square meter. It can be used for flooring, table tops, walls and feature areas. Check out the UK company Ting‘s website for more fashion products that are made from found seatbelts and strapping. This is a totally amazing way of recycling old leather into flooring. I love it. Thirty-six ideas for the future: The name that Ennio Capasa gave his collection was timely to a fault. At a moment when the world is poised for major change, it would be uplifting to think that a fashion collection might offer additional pointers. But when the actual show started, the uplift quickly turned downward. Nothing ultimately wrong with that—Capasa was operating perfectly efficiently within his own frame of reference. Sustainability was one of the points he wanted to make, and he did a great job with recycled fabrics (particularly a silk bamboo and a sheer aluminum). He also wanted to underscore the fact that a modern man would rank global warming alongside looking hot. So he conflated activism and eroticism by layering sheer shirts and outerwear in that recycled aluminum. But Capasa’s heart belongs so completely to the dark glamour of his formative years that he just can’t help himself when it comes to a sequined lapel or shirt placket. The silvery palette of this collection suggested there is now a little moonlight in his night, but I’m still waiting for at least another 32 ideas. Moving beyond the once revolutionary LEED (Leadership in Environmental and Energy Design) scope of strategies and requirements for building green, Cascadia, the Northwest chapter of the U.S. Green Building Council’s Living Building Challenge meets once unimagined sustainability standards in areas of Site, Water, Energy, Materials, Indoor Quality, Beauty and Inspiration and Process and Leadership. Using a guideline of 20 prerequisites, the initiative supports buildings as not only self-sustaining structures but as those that harmoniously give back more than they take from the environments in which they’re built. They’re living buildings—literally. Bringing to mind the age-old parable that “if you give a man a fish, you feed him for a day, but if you teach a man to fish, you feed him for a lifetime,” an educational component, the Living Building Leader program, aims to cultivate its own crop of green building pioneers that will enable unprecedented strides in the design and construction industry for generations to come. The Living Building Leader Program is, as Cascadia eloquently puts it, “a series of intensive, advanced eLearning sessions in green building topics, taught by experts in the diverse fields that underpin the multidisciplinary field that is green building.” Aimed at green building pros worldwide, many of whom may have already acquired previous training such as LEED Professional Accreditation, the program supplements their green building chops in a way that will most certainly distinguish them in their respective fields of Architecture, Engineering, Design, and Construction. Already spawning elegant designs such as Mithun’s vertical urban farms (which one best of show last year), Cascadia’s poised to be the standard-bearer for the next generation of green building. Many burgeoning labels these days claim to have evolved organically. But for the new Brooklyn-based collection Bodkin, it rings especially true. As it happens, the collection—co-conceived and created by designer Samantha Pleet and writer Eviana Hartman—is as organic as the friendship that’s grown between them. What began as an introduction through mutual friends soon gave way to discovering a myriad of shared interests and what Hartman describes as “eerily similar senses of style and aesthetic references…and we borrow each others’ clothes all the time,” she says. When both were in need of a studio, deciding to share a workspace seemed like a natural fit, and it wasn’t long after setting up shop that they were brainstorming a line of clothes that all of us would soon want to borrow ourselves.